TO OVERCOME DIFFICULT GRADIENTS the engineers on the Bernina Railway have used a spiral location near Brusio. On some stretches the Bernina Railway electrically operates trains working by adhesion, up to gradients as steep as 1 in 14. THE Republic of Switzerland, owing to its geographical position between France, Germany, Austria, and Italy, is traversed by several railway routes of international importance. Along these main lines run the “Simplon-Orient”, Gothard, and other famous expresses, Many of these take the country in their stride, yielding their passengers little more than tantalizing glimpses of Swiss mountain scenery. Other international trains, such as the “Oberland” and “Engadine” expresses end their journeys in Switzerland. In the “Glacier Express” Switzerland possesses at least one named train which keeps entirely within Swiss territory. The train bears little resemblance to the international expresses which regard the republic as a mere thoroughfare. It runs over a series of metre-gauge lines, independent of the Swiss Federal Railways, from St. Moritz to Zermatt. The distance is only 167½ miles, but the journey takes over ten and a half hours, so that the title of “express” is one of courtesy only. But the difficulties of the route are stupendous. Every device of the railway engineer has been called into play to surmount the differences of level. Spiral sweeps and corkscrew tunnels abound, and even rack-and-pinion propulsion is used at times. The passenger’s reward is a journey of entrancing beauty, and a close view of mountain scenery which could otherwise hardly have been obtained except on foot. The “Glacier Express” runs, during the height of the summer season only, since a considerable section of its route is closed down in winter, owing partly to the rigours of the climate and partly to the seasonal nature of the traffic. A large section of the line is worked by electricity; but a stretch of over fifty miles relies on steam haulage. In view of the gradients encountered the through train is normally limited to a load of four coaches, weighing in all fifty-five to sixty tons. The weight has been kept as low as possible by the use of arc-welded frames and aluminium body panels. Over less severe sections of the line one or two extra coaches may be temporarily attached. The three narrow-gauge systems involved are - the Albula line and other sections of the Rhaetian Railways, which serve the sparsely populated Grisons, Switzerland’s eastern-most and largest canton; the Furka-Oberalp line; and the Visp-Zermatt Railway. But, in order to complete a survey of these railways - scenic in the true sense of the word - it is really necessary to include the Bernina Railway. This starts from Tirano, just within the Italian frontier, and runs northwards to St. Moritz. THE ROUTE OF THE EXPRESS. Although the journey described in this chapter begins at Tirano, the “Glacier Express” runs as shown between St. Moritz and Zermatt. The difficulties of the route will be best appreciated by looking at the map. In mountainous countries road and railway engineers alike naturally gravitate to the great river valleys, as the lines of least resist-ance. Unfortunately, the head of a mountain valley is almost always a mount-ain barrier, which forms the watershed between one river system and another. A glance at a contour map of Switzerland will reveal the surprising fact that two of the most important rivers in Europe - whose estuaries are at different ends of the continent - rise within a dozen miles of one another. Between them rises a formidable wall of rock traversed by the Furka Pass. To the west of the pass the Rhone glacier is the source of the Rhone, which flows down the Rhone Valley to the Lake of Geneva on its way to the Mediterranean. To the east is the insignificant Lake Toma, source of the Vorder Rhein, one of the many tributaries of the Rhine. From the Bernardino Pass, in the south of the Grisons, the Hinter Rhein, another tributary, runs north to Reichenau, where it joins the Vorder Rhein. Part of the Rhone Valley is used by the Simplon main line. The narrow-gauge lines traversed by the “Glacier Express” make use of all three river valleys. It is the watersheds encountered on the way that have given the railway engineers concerned their most difficult problems. The switchback nature of the journey will be understood with the help of a few statistics. From Tirano at 1,405 ft the line rises to 7,400 ft on the Bernina Pass, dropping to 1,995 ft at Reichenau-Tamins. It then ascends the valley of the Vorder Rhein, and climbs over the Oberalp Pass, 6,720 ft, into Andermatt, 4,740 ft on the top of the St. Gothard Tunnel and at the foot of the final ascent of the St. Gothard Pass. It next tunnels under the Furka Pass at a height of 7,120 ft, after which there is a steady descent of the Rhone Valley to Visp, 2,080 ft, followed by the final climb to Zermatt, 5,280 ft above sea-level. The total vertical rise is 16,200 ft - greater than the height of Mont Blanc. A FINE SWEEP OF LINE on the Furka-Oberalp Railway, which takes its name from the Furka and Oberalp passes, through which the line runs. The lower section is seen coming up the Rhone valley, and reaches the upper level in the foreground, by a spiral tunnel. Tirano, where we begin our journey, is the terminus of a branch of the Italian State Railways. From Leeco, at the southern end of Lake Como, the branch skirts the eastern shore of the lake, and then, for over forty miles, climbs the Val Tellina - the valley of the Adda - to Tirano. Here the Bernina train is waiting; and we may note that, despite the terrific gradients over which it is presently to pass, the short train is provided with a well-appointed little dining-car. A mile out of Tirano we cross the frontier into Switzerland, in the narrow defile of the Poschiavino torrent, noticing near the line the enormous 36,000 hp Brusio hydro-electric power-station. This produces current not only for the Bernina Railway, but also for many great industrial undertakings in the north of Italy. We see the village of Brusio well above us; to reach it, the railway describes a complete circle, climbing all the time, and crossing itself by a high viaduct so that in the first four and a half miles an ascent of 1,255 ft is made. We next pass the health resort of Le Prese, on the Lago di Poschiavo, a small lake under two miles long. Ten miles of steady climbing from Tirano bring us to Poschiavo, the principal town in the valley, 3,315 ft above the sea. It is noted for its carnations. A tremendous problem now lay before the builders of the railway. The main rampart of the Alps of the Bernina and the Rosegdies directly athwart the path of the line. The lowest level at which it could be crossed was the Bernina Pass, less than six miles ahead, but more than 4,000 ft above Poschiavo How could this be done? 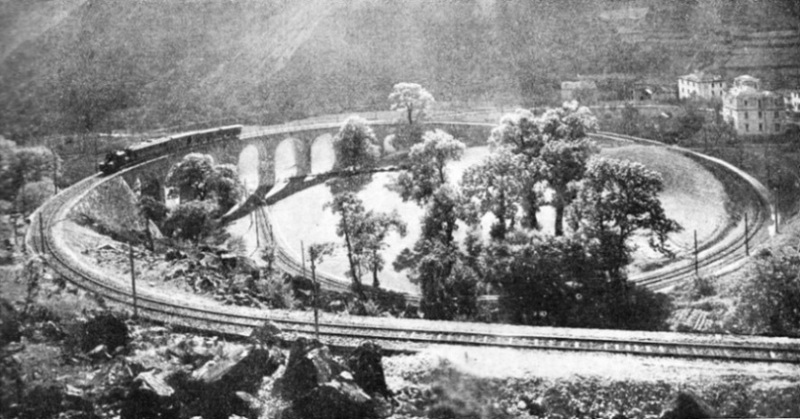 The answer was to steepen the gradient to 7 per cent - 1 in 14, the inclination of a fairly steep road, let alone a railway - and to adopt a spiral layout of the most extraordinary description, to conquer this immense difference in level. What is more, this 1 in 14 grade is worked entirely by adhesion, without any rack-and-pinion assistance, and it is one of the steepest adhesion railways in the world. First the line sweeps to and fro in two great double curves on the open mountain side at the head of the valley, making the elbow bends by means of short spiral tunnels. Then it finds a narrow opening - the gorge of the Cavagliasco - through which it passes into the glacial basin of Cavaglia. After two more loops in the Pila valley we pass round the jutting headland directly towards the great Palü glacier, one of the most beautiful in the Alps. Still mounting steadily, we make two final double loops, and reach the station at Alp Grüm, in full view of the glittering ice-clad summit of Piz Palü. At Alp Grüm we take one last backward look at the Poschiavo Valley, now spread out in a panorama of wonderful beauty. After a few more turns and twists, with some avalanche tunnels thrown in, we reach the Bernina Hospice, on the Lago Bianco, at the crest of the pass. The hospice stands 7,400 ft above sea-level, and is the highest point in Europe reached by adhesion alone. As the crow flies Tirano is but sixteen miles away in all; but the railway has travelled nearly twenty-four miles. The descent to Pontresina and St. Moritz involves no great engineering difficulties, since these two well-known resorts both lie nearly 6,000 ft above the sea. The ten miles from the summit to Pontresina are very beautiful. On the left is seen the Morteratsch Glacier, encircled by dazzling snow-clad peaks. Passing through Pontresina, famous for its winter sports, and thronged by visitors in summer also, we reach the terminus of the Bernina Railway at St. Moritz, the highest town and the most populous place in the upper Engadine. The Engadine is the upper or Swiss section of the valley of the Inn, one of the tributaries of the Danube. The valley extends for sixty miles from Martinsbrück on the north east (3,400 ft) to Maloja (5,960 ft) in the south west. Although the fame of St. Moritz is due to the excellence of its winter sports, we shall not find it by any means deserted in summer, since it is also a noted health resort. Here we have to spend the night, as the through journey from Tirano to Zermatt is not possible in one day. AN EXTRAORDINARY SPIRAL. Descending from Preda to Bergün the line is carried through three spiral tunnels, and round a loop in a lateral valley, to achieve a descent of 1,368 ft. in 3¾ miles. The railway actually travels 7½ miles in making the descent. The next morning, immediately after breakfast, we return to the railway station, in order to catch the “Glacier Express”, which makes an early start. We hope for the finest of fine days, as otherwise many of the most spectacular features of the scenery may be obscured by clouds. 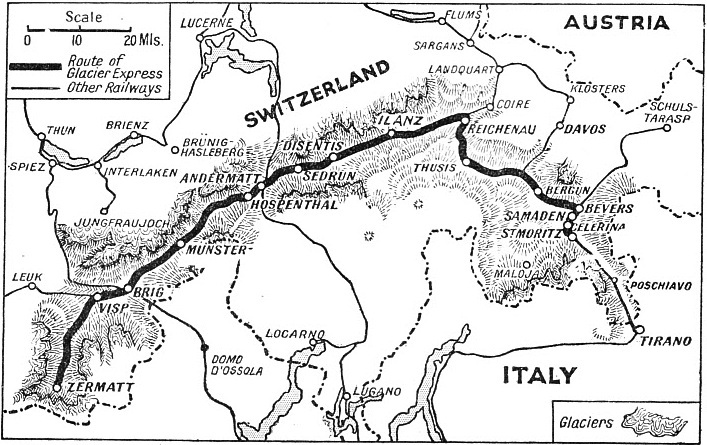 The first section, from St. Moritz to Thusis, is known as the Albula Railway. It was built between 1898 and 1903, at a cost of one million pounds. We begin by descending the Upper Engadine, past Celerina and Samaden, to Bevers, whence a thirty miles branch continues onwards down the Inn almost to the Austrian frontier, at Schuls-Tarasp. As far as Bevers we have been travelling in a north-easterly direction; or almost exactly in the opposite direction to Zermatt, but now the line makes a right-angled bend, and presently enters a tunnel. AN ELECTRIC LOCOMOTIVE hauling an express on the Visp-Zermatt Railway. The line runs through the Visp Valley to the famous health resort of Zermatt and has to climb 3,210 ft in twenty-two and a half miles. This is the Albula Tunnel, which carries the line through from the watershed of the Danube to that of the Rhine. Although its length of 3¾ miles is but modest as compared with such giants as the Simplon, the St. Gothard, and the Lötschberg, yet the difficulties overcome in its construction were exceptional. They arose because of the altitude at which the work was carried out, for the centre of the tunnel is 5,998 ft above the sea. Ice-cold springs broke into the workings, and at one stage caused a suspension of fifteen months in the boring. But, despite the interruption, four years, from 1898 to 1902, saw the completion of the work. At Preda the train emerges into the Albula Valley, and, apparently, into a new world. Here much more vegetation is to be seen than in the high-altitude valleys through which we have been passing until now. 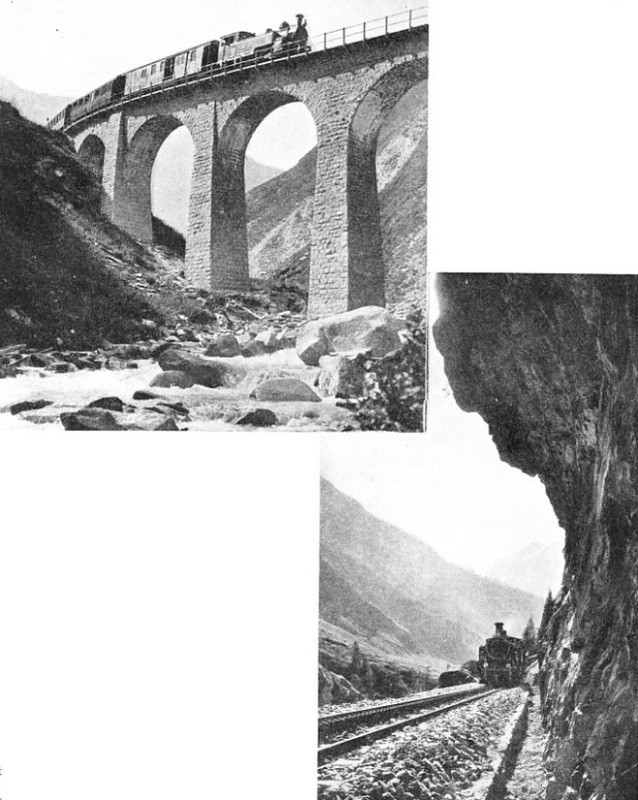 The next section of the line presented further extraordinary problems to the engineer responsible for building the Albula Railway. The valley falls very steeply - so steeply, in fact, that the large village of Bergün, 3¾ miles from Preda as the crow flies, lies 1,368 ft below it. This difference of level is much less than that on the Bernina Railway between Alp Grüm and Poschiavo. But the relative importance of the Albula Railway rendered such gradients as 1 in 14 out of the question. An inclination of 1 in 29 was the steepest that the engineer dare contemplate. This could be effected only by doubling the length of line between Preda and Bergün, in order to flatten out the gradient. Two out of the 7¾ miles are in spiral tunnels. And so, shortly after leaving Preda, we find the train turning to the right into the mountains at the side of the valley. Through Zuondra Tunnel, 586 yards long, we proceed in a complete corkscrew turn. Emerging, we cross the Albula by a viaduct, and almost immediately re-cross by a bigger viaduct to enter Toua Tunnel, in whose 740 yards of length we describe a second spiral immediately under the first. 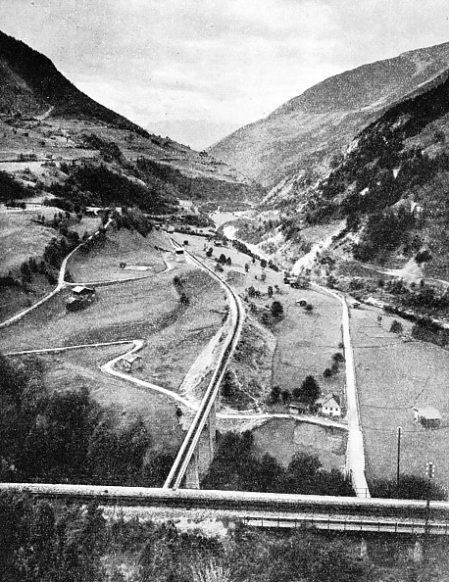 For the third time the Albula is crossed, and the line is now carried through the 724 yards of the Rugnux Tunnel; a third spiral, but this time in the mountains on the left bank of the Albula torrent. 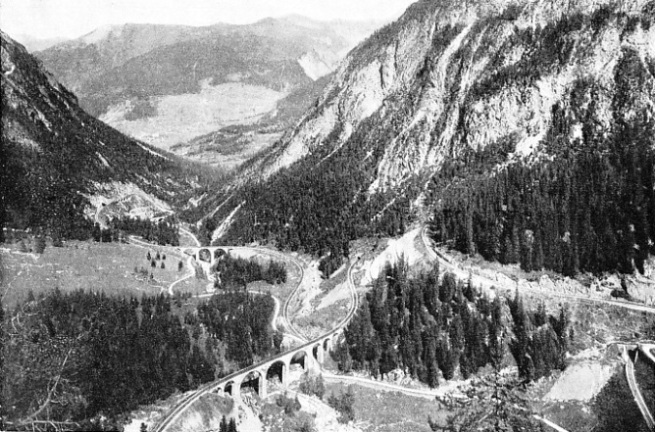 Last of all, after a fourth crossing of the Albula, the railway turns to the north-cast, into the lateral valley of the Tuorsbach, to conquer the remainder of the difference in level, and to reach Bergün. To the traveller these incessant contortions of the railway are bewildering indeed. Bergün is a prosperous little village lying at the foot of the well-known bob-sleigh run from Preda. In the course of the next section of the line, to Filisur, there is one more spiral tunnel. By this time we have travelled twenty-four miles from St. Moritz, and have descended to 3,550 ft above sea level. At Filisur the Albula River falls into the Landwasser. Here we part company with the branch line which makes its way up the Landwasser Valley to Davos-Platz, as we are to travel down the valley. Our introduction to the Landwasser is thrilling indeed. Without any warning, we emerge from a short tunnel on to the full height of the sharply-curved Landwasser Viaduct, 213 ft above the valley floor. The easternmost arch of the viaduct has no masonry pier to support it, but takes its springing directly from the living rock of the sheer precipice through which the tunnel has been driven. As we curve round to the west we obtain a magnificent view of this startling railway structure. Another remarkable bridge is that at Solis, where the Landwasser has dropped into the beginning of the abysmal Schyn ravine. Here the waters of the river are 292 ft below the rail level, but good foundations for the main arch of the viaduct - which has a span of 138 ft - were found high up on both sides of the gorge, and the cost was thus kept within reasonable limits. Rapidly descending through a series of tunnels, and with no gradient over this section of the line steeper than 1 in 40, we find ourselves at Thusis, 38½ miles from St. Moritz. Thusis is a small market-town lying at the confluence of the Landwasser and the Hinter Rhein. The Hinter Rhein pours out of the Via Mala, a forbidding gorge over three miles long with perpendicular limestone cliffs rising to 1,600 ft and only 30 ft apart in places. In the neighbourhood of Thusis is the medieval castle of Hohen-Rhätien, ascribed to the mythical Etruscan Rhaetus. The line, accompanied by the Hinter Rhein, continues to descend. Eleven miles beyond Thusis we reach the railway junction of Reichenau-Tamins and the line from Coire to Brig. Coire, or Chur, the chief town of the Grisons canton, is only six miles from the junction. We have now descended to an altitude of 1,905 ft, the lowest point on the whole journey from St. Moritz to Zermatt. Reichenau lies at the junction of the two branches of the Rhine, which now proceeds past Coire on its lengthy course to the North Sea. At the station of Reichenau-Tamins the “Glacier Express” attaches a through carriage from Coire, taken off a little train that has been awaiting us. Since the next part of our journey is up the valley of the Vorder Rhein, our express has to reverse its course, and we now start away for Disentis. The most interesting part of this section of the journey is the romantic and sinuous course that the river has carved for itself through the immense prehistoric landslip of Flims. The precipitous sides of this gorge do not consist of rock, but of avalanche debris, from which large stones often fall in the springtime. It has, therefore, been necessary to protect the railway, partly by leaving a space, into which the stones may fall, between the railway and the din, and partly by building the line, with the protection of large masonry dykes, in the bed of the stream, which here is very wide. Disentis, thirty-six and a half miles from Reichenau. is reached at about midday. We pass half-way the beautifully situated village of Ilanz, at the entrance of the Lugnetz Valley. Electricity now gives place, for the time, to steam. We are about to pass from the Rhaetian Railways to the Furka-Oberalp Railway. The limited traffic obtainable through the very sparsely-populated area traversed between here and Brig could never have justified the capital cost of electrical equipment. So steam comes to the rescue, and we shall proceed by its aid for the next fifty-two and a half miles. A tank locomotive is attached to the head of the “Glacier Express”, whose load is now limited to four coaches, in preparation for the extremely steep inclines ahead. In parts the inclines steepen to 1 in 11, and even to 1 in 10, involving the assistance of rack-and-pinion propulsion. The engine is so designed that it can be worked either as an adhesion locomotive or as a rack locomotive. Shortly after leaving Disentis, with its great white Benedictine abbey, the rack comes into use, and in the next twelve miles, carrying the line to the crest of the Oberalp Pass, there are two long stretches of rack-equipped track. Once again the “Glacier Express” has mounted well above the tree-line, and goes winding along the shore of the lake at the summit of the Oberalp - the Oberalpsee, 6,720 ft above sea-level. Immediately afterwards the great basin of the Reuss comes into view, with the important village of Andermatt lying right below us. The traveller might well imagine that a stone thrown from the train would hit the slender church spire. 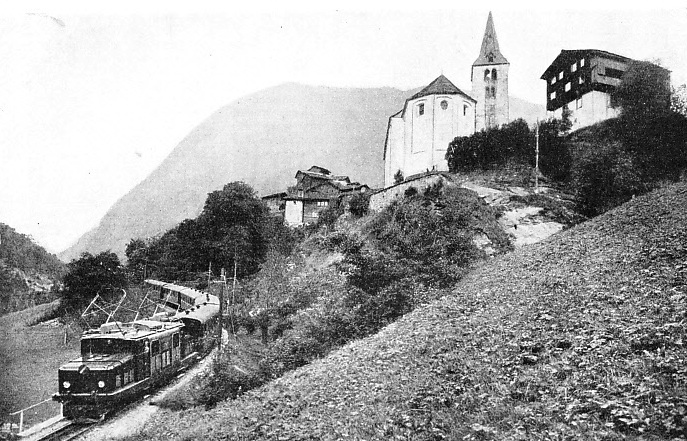 Some tortuous travelling on two immense loops entirely rack-equipped, on the open mountain-side, is needed for the train to negotiate the intervening 2,000 ft difference in level, and to reach the village. Here we cross the St. Gothard main line from Lucerne to Bellinzona and Milan. But we cannot see it, as the trains are passing over a thousand feet below us in the St. Gothard Tunnel. A short electric line, however, runs up the Schöllenen Gorge from Göschenen to Andermatt, thus connecting the two lines. 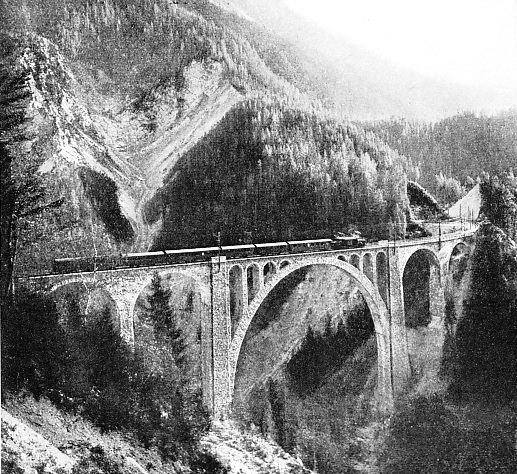 WIESEN BRIDGE on the Rhaetian Railways. The structure is situated on the Davos-Filisur line. The train on the main arch - whose span is 180 ft - is being carried 289 ft above the waters of the Landwasser River. And now we have to climb to the highest altitude that is attained by the “Glacier Express”, although we were a little higher in level when coming over the Bernina Pass on the way from Tirano to St. Moritz. The barrier between the Rhine and Rhone lies immediately ahead. 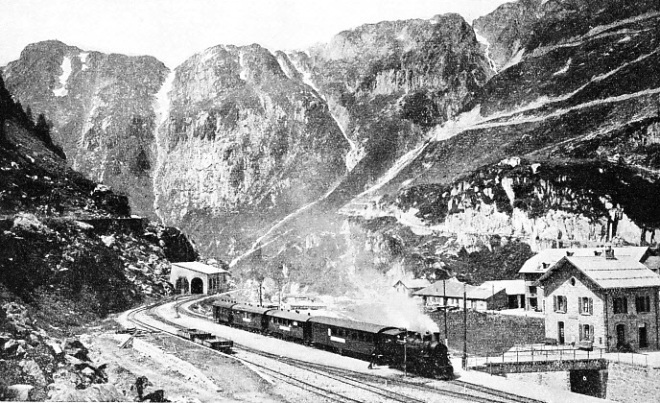 Fortunately for the locomotive, the full height of the Furka Pass, which is 7,990 ft. above the sea, has been avoided by the boring of the Furka Tunnel, 2,138 yards in length, through the crest of the ridge. But even the tunnel is at an altitude of 7,120 ft, and the approaches from both sides consist of long stretches of rack-equipped line, over which the speed is, of necessity, very low. No complaint on this score will be made by the traveller, because the descent from the tunnel to Gletsch is made throughout in full view of the great Rhone glacier, greenish-blue in colour, and with deep crevasses glittering in the sun. In two and a half miles from the Furka Tunnel the line descends 1,410 ft. The difficulty of traversing the thirteen miles from Andermatt to Gletsch is shown by the fact that the train requires an hour and a quarter to complete the journey. High above us, on the opposite side of the Rhone Valley, which we have just entered, are seen the zigzags of the road to Meiringen, which climbs over the summit of the Grimsel Pass from Gletsch. A railway route has been surveyed between Gletsch and Meiringen, which would link the Furka-Oberalp line with the metre-gauge Brunig Railway, and so permit the running of through trains from Interlaken or Lucerne to Zermatt or St. Moritz by this incomparable route. The great cost has so far prevented the carrying out of this project. Leaving Gletsch, we proceed down the Rhone Valley, high mountains on each side, until, near the village of Griengiols, we pass an almost perpendicular cliff, with another railway emerging far below us, in a lower basin of the valley. This is, of course, the continuation of the Furka-Oberalp line, and by another completely corkscrew tunnel we reach the lower level, the rack-and-pinion constantly in use. Presently the mouth of the great Simplon Tunnel comes into view on the south side of the valley, and a couple of miles later we sweep round in a great curve, cross the Rhone, and reach Brig Station. Once more the “Glacier Express” reverses its course. One of the fine modern electric locomotives of the Visp-Zermatt Railway backs on, for electricity is to haul us over the final twenty-seven miles of the journey. For the first five and a half miles from Brig we continue down the Rhone Valley alongside the Simplon main line, and quite possibly our train may be passed by one of the expresses running to France from Italy and beyond over this important traffic artery. On reaching Visp we are again down in altitude to 2,080 ft. Here we turn south, into the deep valley of the Visp, up which, in less than twenty-two miles, we shall climb 3,200 ft. It is a fitting end to an astounding trip. Beside the line, all the way to Zermatt, rushes the blue-white torrent of the Visp, fed almost entirely by glacier water. After we have travelled three and a half miles, the rack comes into view. The locomotive, equipped for both rack and adhesion working, changes to the former to ascend a gradient as steep as 1 in 8, in the middle of which is the station at Stalden. Speed drops from twenty-eight miles an hour to ten or less, though this is fast in view of the load and the gradient. Altogether four rack-and-pinion sections have to be negotiated at different points along the route, with gradients varying from 1 in 8 to 1 in 13. Still steadily climbing, the train reaches St. Niklaus, where the sides of this narrow V-shaped valley are so high that the sun never reaches the village at all in winter. The climax of the journey is reached in the last mile, when the magnificent granite pyramid of the Matterhorn suddenly bursts into view. At 7 o’clock in the evening we run into Zermatt, 5,280 ft above the sea. The journey of the “Glacier Express” is finished. Our time of 10 hours 40 minutes for the 167½ miles from St. Moritz may not appear remarkable, but the train has been lifted over sixteen thousand feet. THE STATION AT GLETSCH on the Furka-Oberalp Railway is reached after the train has passed through a mile-long tunnel at the Furka summit, 7,120 ft above sea-level. Gletsch lies at 5,784 ft above the sea. You can read more on “The Edelweiss Pullman”, “The Engadine Express” and “The St Gotthard Pullman Express” on this website. AN IMPRESSIVE MASONRY VIADUCT on the Furka-Oberalp Railway crossing the torrent of the Reuss between the Furka tunnel and Hospenthal. RACK AND ADHESION locomotives haul trains on the Furka-Oberalp Railway. Ordinary driving wheels operate on the adhesion sections; on the rack sections - such as the one shown here - the pinion wheel engages with the centre rack-rail.